With a legacy spanning 50 years, Missionary of Our Lady of La Salette, Father Roland Nadeau is genuinely grateful for his time as priest. “Thank God for the blessings he has given me,” he said. 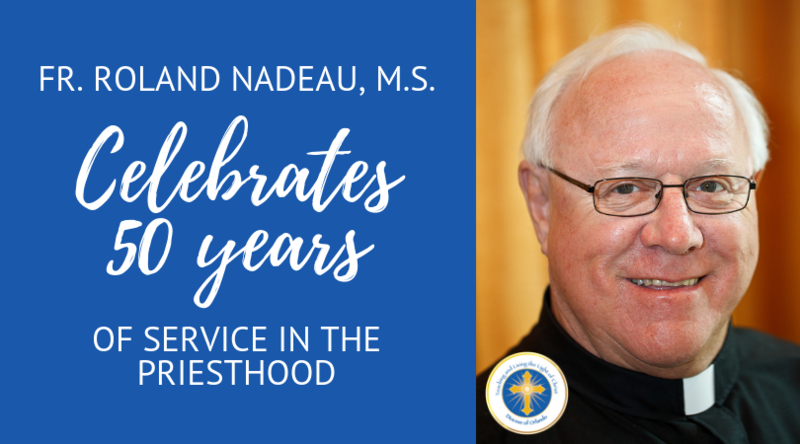 Ordained at the age of 25 on Oct. 11, 1969, at St. Cecilia Parish in Pawtucket, Rhode Island, Father Nadeau went on to serve on a variety of committees and agencies. He dedicated his life to the Lord since he was a child attending Our Lady of Good Counsel in Pittsfield, Massachusetts, and later graduating from the University of Ottawa. Bishop Noonan invites all the faithful to join the celebration of the Chrism Mass on April 17, 2019 from 6:30 p.m. – 8:00 p.m. The Mass will be livestreamed via Facebook Live (https://www.facebook.com/orlandodiocese/) and http://live.orlandodiocese.org/. During the Mass, Bishop Noonan will consecrate the holy oils used in Sacraments and other celebrations during the year, priests will renew their priestly commitment and jubilarian priests celebrating 25 and 50 years anniversaries of Ordination will be honored.